Indian River pitcher J.J. Killen sends one to homeplate during IR’s 7-4 loss to the Dover Senators on Thursday, May 24. 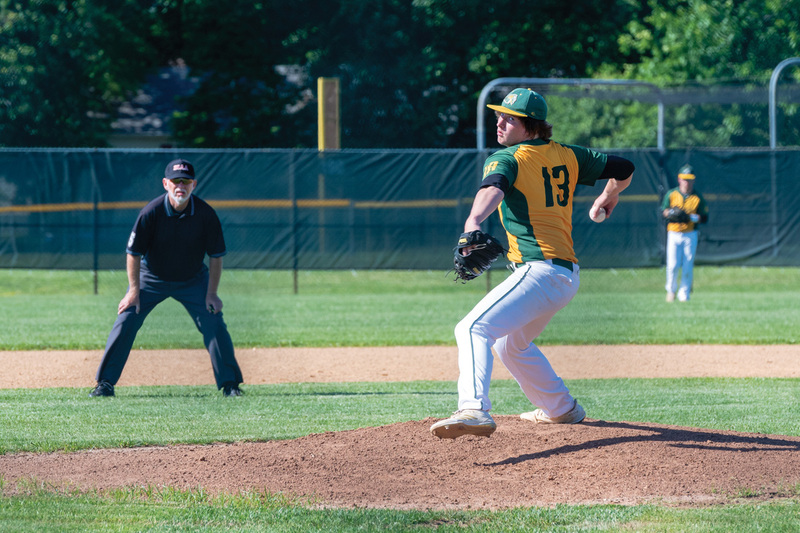 The Indian River High School baseball squad had been rolling over the past two or three weeks, clinching the Henlopen Conference South Division championship and earning a berth in the DIAA state championship tournament. In only their second season under head coach Derek “D.J.” Long, the Indians have made a marked improvement from a 2017 campaign that saw them go 6-12. After an 11-7 regular season and spot in the postseason, the Indians were looking forward to continuing their late-season success. Little did they expect to run into a team, in Dover, that may have been playing just as strong as they were down the stretch. The Senators had come in at 11-6 overall and had won six of their last eight games entering the postseason. A quick five-run first inning off IR starter J.J. Killen was all the Senators would need, en route to a 7-4 win over the Indians. The loss was bittersweet IR, as they had had high hopes of at least advancing into the second round. Dover’s Hiram Davis pitched six effective and strong innings for the Senators, striking out eight. Chris Dabney and Andrew Carney both had RBI singles in the blistering first inning for Dover, while Nathan Turner added a two-run double. Mike Carrington reached base all four times for Dover, and he picked up the save as well. IR’s Jacob Anderson, Mark Smith and Killen each had three-hit days for the Indians in the loss. Extra bases: As of Coastal Point press time on Wednesday, Dover was still alive in the DIAA state playoffs bracket, having followed up the win against IR with a 7-2 decision over William Penn in the second round. They were set to face Salesianum School in the semifinals on Wednesday afternoon.